This is a silly little plugin that will allow your members to personalize their mention @handle with the nickname that they prefer, without having to change their username on the forum. 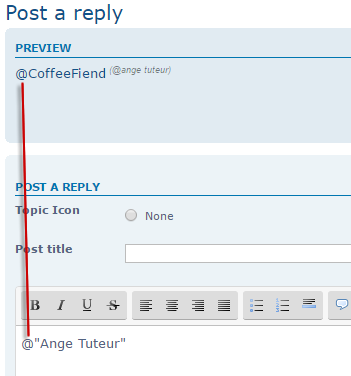 For example ; Mentioning @'Ange Tuteur' would display @CoffeeFiend instead, along with an optional tag that shows the member's original @handle. - Mentioning @CoffeeFiend will not tag @'Ange Tuteur'. You must use the member's default @handle to tag them. Before we install this plugin we first need to create a new profile field for our members. Go to Admin Panel > Users & Groups > Profiles and create a new profile field with the following settings. Down below there should be additional information under text zone. Paste the following content as the default value for the field. You can set the max length as you like. If everything looks okay to you click the save button. Then edit the newly created field and click the "Replace the content" button at the very bottom to force the default value. Once you've done this you're ready to move onto the installation of the script. Each set of digits represents an hour, minute, second, etc.. Use the comment as a guide, and modify the caching time as you like. and changing "true" to "false". Once you're finished making modifications, save the script and the plugin will be installed ! See the final section for information on how it works ! 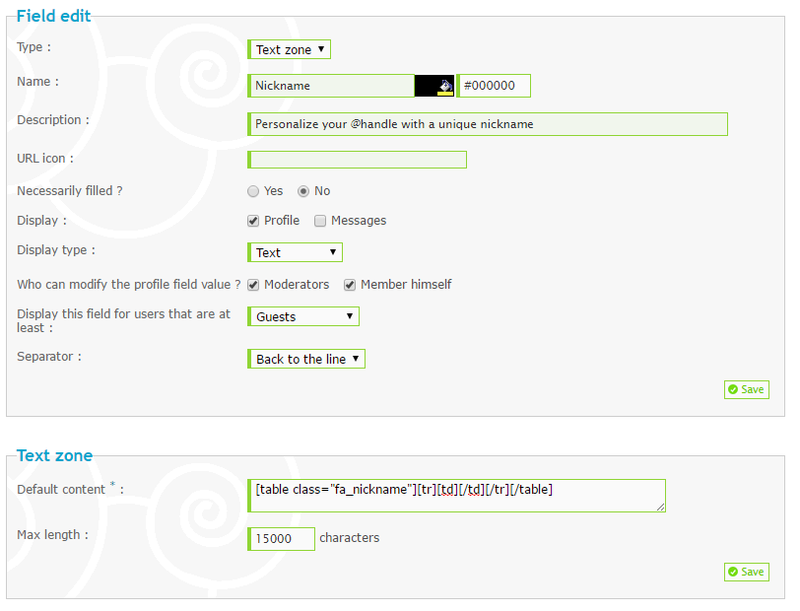 To input your own nickname for your @handles go to the edit profile page which should be accessible from the navbar. Find the field and insert your nickname. Why should my nickname be between table tags ? It's necessary for your nickname to be between table tags so that the script can quickly identify your nickname and place it in your @handle. Removing the table tags will prevent your nickname from being displayed in your @handle. I changed my nickname, but it's still the same !! Don't worry, nicknames are cached for *1 hour to prevent repeated requests to the server. You can force your new nickname on your end by clearing your cache. *This time can be changed by an administrator. If you have any questions or comments feel free to leave a reply below. Go make some silly @handles ! Tutorial written by Ange Tuteur. Special thanks to @Samantha for the idea and to the Beta Testers for testing this plugin. Reproduction not permitted without consent from the author. LOL yeah, I decided to do that because a few other people missed it as well. This is new stuff, thanks for sharing!